Sometimes making people and dogs afraid of something can rehabilitate them and change their lives. This is called "Scared Straight". However, in many cases people and dogs have already been scared nearly to death and they battle with Post Traumatic Stress Disorder. I have PTSD and have had it most of my life. For years I hid my fears and never told anyone I had panic attacks and severe anxiety. But when I realized that many people who have traumatic or abusive pasts deal with this as well and also hide, I knew I had to share my story to help them. I quit school at only 13 and ran away from home to get away from the abuse, bullying and violence that was forced on me as a child. Sadly, I only found more abuse when I lived out on the streets for those two years. Then I suffered through two abusive marriages. I ran from one scary situation to the next for many years. Does Your Puppy, Rescue or Dog Have PTSD? This is exactly what many puppies and dogs go through. Some dogs runaway, other dogs are dumped, and even more live out their days in puppy mills crated to wallow in their own feces never seeing the light of day, and others may wait out their last days in a high kill shelter. We have no idea what many of these puppies and dogs have faced by the time we rescue them, foster them, and adopt them. Most pups and dogs have some kind of baggage as well as Post Traumatic Stress Disorder. 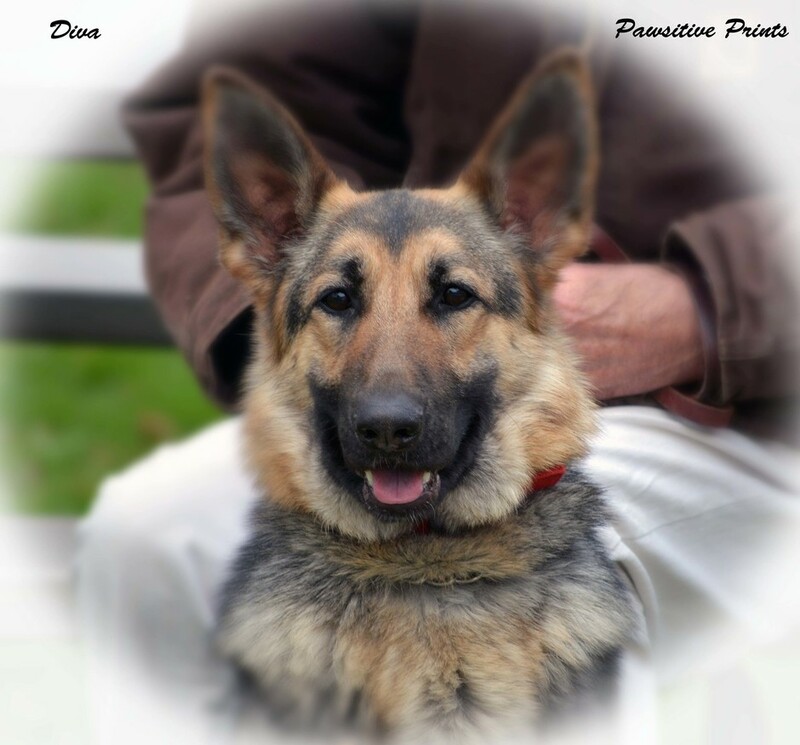 Diva came from a line of German Shepherd show dogs. Her owner, Mr. Peterson, bought her from a breeder this spring. When he brought her to my group dog training class, she hid behind him and darted about frantically when anyone or any dog came too close. He brought her to a few classes, but seeing no progress he called me and said he wasn't going to bring her anymore. He informed me that at home she was urinating on the floor, not coming when called, and not minding. I suggested private lessons. After the first session Dive made some progress and Mr. Peterson reported that she was fully housebroken, and she was sitting and coming on command. After just three short sessions she is laying down and staying as well as walking beside me on a loose leash without pulling. She now trusts me and is licking my hands, where she used to avoid me and spin around in circles trying to get away from me. Fear in dogs can make them unsafe to themselves and others. They can display numerous behaviors; hiding, cowering, not eating or drinking, wetting or defecating, vomiting, jumping at every sound, circling, and running. If they are not properly trained they can even become aggression toward other animals and people. Fear aggression is one of the worst forms of aggression because when a dog is fearful it is not acting rational and can strike out without any warning. 1. Never encourage their fears by saying "It's okay"
As an abuse survivor myself, I understand people and dogs who are victims of PTSD as well as those who bully. By using a mix of love, discipline, and reward, I've been able to break through the barriers that many of these people and dogs possess, to help them change their behaviors and be healthy and safe so they can enjoy their life and be free from fear and pain.